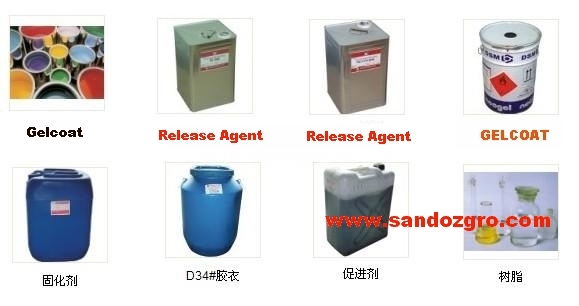 SANDOZ offers a wide variety of Gel Coat. We offer a complete line of clear and pigmented gelcoats designed for composites and cast polymer applications. Our gelcoats provide molders with the ability to produce parts with added resistance and smooth outer surfaces. We also offer general purpose gelcoats that are MACT compliant. Gel coat is used as an in mold coating on composite parts to produce a durable part surface. We stock a wide variety of colors in marine and tooling gelcoat. Gelcoat derives its name due to it high viscosity and ability to be applied thickly on vertical and overhead surfaces in one coat. Gel coat is air inhibited and cures tacky on the surface to bond with the lamination. For top coating with gelcoat you will need to use SANDOZ High Gloss additive or Surface Agent to get a tack free cure. Gel Coat is a polyester coating that is applied to the mold surface and becomes an integral part of the finished product. Available in most popular colors. Used to make fiberglass reinforced plastic parts and for repairs to existing gel coated parts. Tooling Gel Coat is formulated specifically for mold making. Tooling gel coats utilize selected resins that exhibit high heat distortion, high gloss and a hard durable surface to withstand the repeated mold cycles anticipated from a mold. Gel coats are specially modified resins with greater impact and abrasion resistance as well as better surface appearance. Pigmented gel coats provide a finished color to fiberglass parts. Standard are Iso, Iso-NPG and tooling grades. Also available are specialty gel coatsdesigned for pattern work, fire retardancy, cultured marble clear, and other applications.